Part 4 in our series on the “Hail Mary”. Later we will have “Holy Mary” and “Mother of God”: two sides of the same coin. Then the contrasts “Holy Mary” and “us sinners,” “mother of God” and “pray for us,” “pray for us” and “us sinners,” “now” and “at the hour of our death,” “mother” and “death.” All mirrors reflecting back on one another, coins with two sides. The action of God and its reflection in us. There are actually two words for “blessed” in the Greek. Here, it’s eulogeo, which literally means, “spoken well of.” But we also have makarios, which means “happy,” supremely happy. 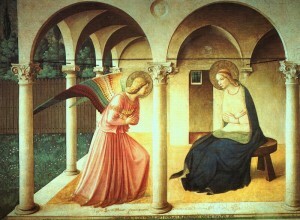 The Beatitudes are makarios, and in the story of the Visitation, Elizabeth goes on to say, “blessed – makarios, happy – is she who believed” and in the Magnificat, Mary will respond, “all generations will call me blessed: makarios.” But actually, in Mary’s words, we see the connection between the two: how do they speak well of her, eulogeo? By calling her the supremely happy one, makarios! And the flip side is that eulogeo, “spoken well of,” also goes two ways: we speak well of her because she is happy. But she is happy because God has spoken well of her: he has given her is “blessing.” God’s word makes it happen. Mary is the one God has given his good word, therefore the supremely happy one, therefore the one we speak well of. The parallel with Jesus is really mind-boggling: but, like other parts of the Hail Mary, it has a claim to be the very Gospel itself. Think of the incongruity of the parallel: Mary is blessed, Jesus is blessed. Now . . . Jesus is God. He is THE blessed one. His blessedness, you would think, is beyond what anyone else can claim, incommunicable. But Elizabeth – or, the Holy Spirit in Elizabeth – claims that Mary is, in a sense, the same. Blessed as Jesus is blessed. That’s how the early Church formulated the Gospel: “God became man so that man could become God”: a favorite saying of the Fathers. And “sons in the Son.” Or as St. Paul says, “You know the grace of Our Lord Jesus Christ, who, though he was rich, yet for our sake he became poor, that you through his poverty might become rich” (2 Cor. 8:9). Jesus didn’t just come to tell us about God, or to fix it up so that we don’t have any more problems with God. He came to share his own blessedness. Mary is the first fruits. This is why, too, the earliest Christians focused on what they called the proto-Evangelium, the first Gospel. “And the Lord God said to the serpent . . . I will put enmity between you and the woman, and between your seed and her seed: he shall bruise your head, and you shall bruise his heel” (Gen. 3:14-15). Who will bruise the serpent’s head? Well, Jesus will – but this is part of the enmity between the serpent and the woman – Jesus is even called just “her seed.” To show Mary crushing the serpent’s head is not a matter of mistaking “she” for “he.” It is a matter of saying that we communicate in his victory. Because he crushes the serpent, so can we. When the Son became man, it wasn’t so we could be “sort of like” sons. It was so that we could truly be sons of God, “whereby exceeding great and precious promises are given to us: that by these things you might be partakers of the divine nature” (2 Peter 1:4). That’s what we mean by “full of grace.” Blessed as he is blessed.